Held in September and produced by Ceremonies & Events, the event is a wonderful opportunity to enjoy a complimentary lunch, live entertainment, information booths, and the camaraderie of your fellow UBC staff colleagues. Ceremonies & Events will be issuing wristbands to all who have registered for the event. Wristbands will be sent to the departmental contact in each department before September. If you haven’t received a wristband and had RSVPed before the close of registration, please check with your departmental contact to ensure you were included on the department list. If you missed registering through your departmental contact for the BBQ and would like to attend, please bring your UBC Card with you to the Registration Table on the day of the event. A limited number of wristbands will be available for late registrants who meet the eligibility criteria and have valid UBC ID. Help make the Welcome Back Staff BBQ waste free (well, almost)! Please bring a water bottle and recycle or compost everything. Ask the onsite sustainability volunteers if you have questions. Please be advised that photos may be taken at this event for use in communication materials. 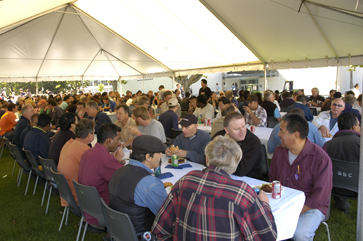 Promote the Staff BBQ within your department! Post the promo poster in a visible area in your office. For inquiries on this event, please contact UBC Ceremonies and Events at ceremonies.rsvp@ubc.ca or 604.822.2484.